Babies that follow the recommended immunization schedule receive nearly 5000mcg (5mg!) of aluminum by 18 months of age. (Since some shot dates are variable, babies may receive up to 1,4 75mcg of aluminum at their 12-month or 15-month checkups!) Source: Product inserts and the CDC' s immunization schedule, 2010. This means that for a 6 pound baby, 1 l-14mcg would be toxic. 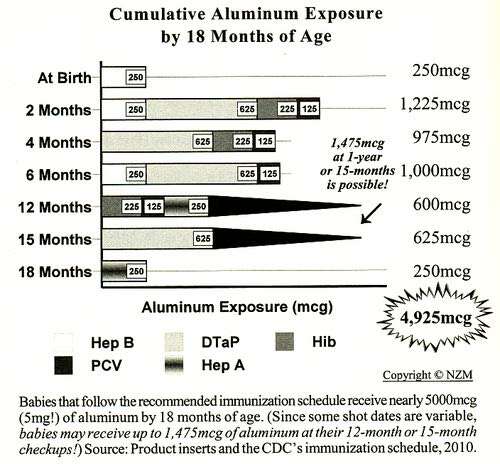 The hepatitis B vaccine given at birth contains 250mcg of aluminum—20 times higher than safety levels! Babies weigh about 12 pounds (5.5kg) at two months of age when they receive l,225mcg of aluminum from their vaccines—50 times higher than safety levels!